Historically, Stephen King's novels and short stories have mostly been profitable investments as source material for filmmakers, that paid off with box office hits and critically acclaimed movies (Carrie, The Shining and The Green Mile, to name a few). Nikolaj Arcel, however, fails to strike gold with his take on King's The Dark Tower series - by both borrowing elements from several novels, and serving as a continuation of the book series, The Dark Tower becomes a clumsy attempt to cover too much ground in too little time, that appeals neither to the fans of the original work nor the people unfamiliar with it. The plot of the movie is not particularly innovative as far as fantasy films go - there is a mysterious object that is essential for the sustenance of life, the forces of evil try to use it to further their own nefarious intents, and the heroes try to prevent an apocalypse while the general populace remains blissfully oblivious. The storyline errs, however, by keeping the audience in the dark for an excessive amount of time about the point of significant happenings and characters. By the time you are finally brought up to speed with the events of the film and their significance, your attention has already begun to wander and you are no longer invested in the plot. Jake (Tom Taylor) is a young teenager whose only apparent oddity is the fact that he has recurring dreams which he likes to turn into sketches. He also has a propensity to beat up bullies who steal his dream journal, which seems like a fairly rational (if slightly overboard) way to deal with antagonizers but which causes his school a disproportionate amount of grief. Surprisingly, Jake's therapist, stepfather and mother (a. k. a. the one with the worst parenting skills since Darth Vader) unaminously decide that an asylum is the only place for this child - who is, for the most part, perfectly functional and sane. 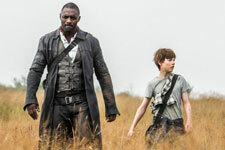 In other news, in other worlds, Jakes dreams are figments of reality, as Roland (Idris Elba) is locked in a battle with the sorceror Walter (Mathew McConaughey), who is trying to effect the destruction of the Dark Tower (the tower that guards the realms of men) through an extreme form of energy conservation. What he plans to do after it is destroyed is a mystery, but perhaps he is more of a make-it-up-as-you-go-along kind of fellow. When Jake becomes a target of Walter The Wizard on account of his psychic abilities, he and Roland join forces to defeat this better-looking version of Lord Voldemort once and for all. The plot is midly engaging, but the lacklustre screenplay leaves it dry as a bone, without a hint of humour or any memorable dialogues to make it more gripping. The characters are underdeveloped, and thus hard to empathize with. The musical score is nothing of note; you barely notice its existence. The cinematography and visual effects do not live up to their potential for a fantasy film full of foreign worlds and magic - every new world simply looks like a slightly tweaked, mundane version of Earth. Oscar-winner Mathew McConaughey is unlikely to be winning any awards for his role in The Dark Tower. Instead of embodying a dangerous, powerful man hunting down an innocent boy to harvest for energy, McConaughey looks more like an exasperated caretaker searching for a particularly difficult young delinquent who keeps running away. He manages to exude the evil of his character occasionally, but fails to live up to expectations on the whole. 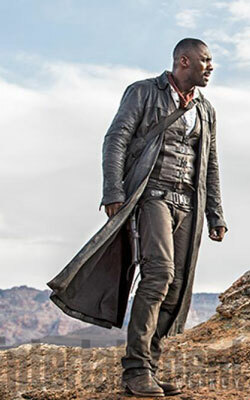 Idris Elba shines in his role as the Gunslinger, and is the film's redeeming quality. He is as stoic, gruff and hardened as his character demands, but still plays the emotional scenes admirably and makes you root for him and his young friend. Casting Ton Taylor is the other thing the movie does right. His portrayal of the misunderstood, troubled adolescent is spot on. The way he plays major emotional upheavals and trauma feels raw, and breaks your heart. Elba is the tower that keeps the dark forces of critic and audience disapproval from destroying this film, but only just. Even he isn't enough to make the film one that is truly worth a watch. Be the first to comment on The Dark Tower! Just use the simple form below. fullhyd.com has 700,000+ monthly visits. Tell Hyderabad what you feel about The Dark Tower!